Baker should have won this. He broke the record for most TD's by a rookie QB in 2.5 games less then Peyton and Wilson and Barkley broke 0 records, Baker had 6 Rookie of the week awards and Saquon had 0, and Baker was more detrimental in those 7 wins as well. This is all my opinion but I base this opinion on the facts. Barkley is an excellent RB, no doubt about it but he should not have won Offensive Rookie of the Year. 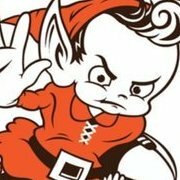 Everyone but other Browns fans disagree with you. At least get your info correct before you claim to be stating "facts." Barkley broke several records (most receptions for rookie RB, most games w/ 100+ yards from scrimmage) and also had more than 0 Rookie of the week awards. Baker breaking the rookie TD record means a lot less considering the # of passing TDs go up every year in the NFL. Baker had a great year for a rookie QB. Barkley had a great year for any RB. As a rookie, Saquon was 2nd in the league in yards from scrimmage. He's already arguably the best RB in the NFL. Baker isn't even a top 15 QB. Was Baker's year more "valuable" when it comes to wins? Yeah, sure, since he's a QB. But there is no "V" in the OROY acronym. It's strictly about the BEST offensive rookie, not most valuable. And Saquon clearly had a better year.